Welcome to Travel Guide 2 Bulgaria, the site about travel, tourism and vacations in Bulgaria. The Republic of Bulgaria is a country in southeastern Europe. 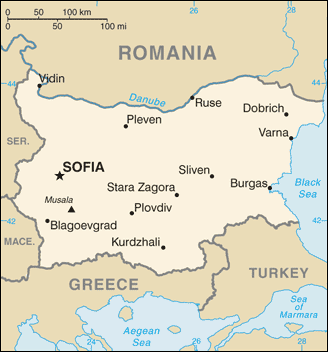 Bulgaria lies on the western shore of the Black Sea, and has borders with Greece, Macedonia, Romania, Serbia and Turkey. As of 2007, Bulgaria has an estimated population of 7,679,290. The country's population has been steadily declining since 1990, when the population was 8,990,000, as a result of economic problems and high emigration. The capital and largest city of Bulgaria is Sofia, which is home to over one and a quarter million people. Sofia is one of the oldest capital cities in Europe, having been the site of a settlement since at least the 8th century BC. Other large cities (over 100,000 population) in the country include Burgas, Dobrich, Pleven, Plovdiv, Rousse, Sliven, Stara Zagoria and Varna. During the communist period (1945 to 1989), Bulgaria's economy was tightly integrated with over the other communist bloc countries in COMECON. Following the collapse of communism in Eastern Europe, Bulgaria's economy went through a difficult transition, with the economy contracting. The standard of living fell by about 40%, and it took until 2004 to recover to 1990 Levels. However, it is not an entirely bleak picture, Bulgaria's economy has been steadily growing at 4% to 5% per year since 1997, the country joined the European Union on January 1st, 2007, and plans to join the eurozone in 2010 (and thus replace the Bulgarian lev with the euro as the country's currency). Bulgaria has a lot to offer the tourist. In the Winter, there are a number of high quality ski resorts in the country's mountains. There are also many Summer resorts in the Black Sea coast including some high quality beaches, as well as some spas which are available all year round. Visitors to the country often find that high quality locations are combined with affordable prices, and it is this combination which now attracts almost 3 million visitors to Bulgaria each year.